Manufacturer of natural handmade soap and bath & body products. Eco-friendly packaging including "tree-free" labels made from Fiberstone (finely ground rock & HDPE plastic). Our products contain only the finest ingredients and are loved by our customers. We do retail, wholesale and private label. I am a wholesale and Retail business. I design and manufacture here on Route 66 Photo Magnets, Photo Key Chains, Photo Bookmarks, Zipper Pulls, and assorted types of jewelry all with a Route 66 theme. I can customize the products for your particular city/state and your establishment. I sell framed and un-framed (dry mounted and matted) photography prints. I have a large and growing selection of photos taken on Route 66. All have been taken with my Nikon digital SLR camera. Books about people and places in the Texas Panhandle. History of Masterson, Texas. Two books based on interviews of men and women, ages 84 to 101 from across the Panhandle. Gift and souvenir products to travel centers. 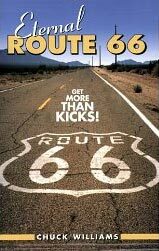 We market our book, Eternal Route 66.